The return of Mandelson to the Government and the proposed privatisation of Royal Mail emanating from the Hooper Review should be the final confirmation to the leadership and activists in the CWU that the Unions relationship with Labour is an abusive one. For a decade the issue of funding of Labour has been the subject of discussion at the Communication Workers Union (CWU) Annual Conference. Varying degrees of support have been won for breaking the link with the Labour Party culminating in the 2008 conference agreeing to ballot CWU members over support for Labour if the government moves to privatise Royal Mail. In light of Labours intent to carry privatisation through, conference policy should be implemented immediately with a recommendation by the NEC to vote to withdraw funding. The issue of �what alternative?� has always been used by the leadership as the cover for remaining affiliated to Labour. In moving Composite 101 calling for support for the CNWP from The Welsh Valleys and Coventry Branch at the 2008 conference I referred to the number of motions and rule changes appearing on the agenda that were critical of Labour and made the point that this government has acted as viciously towards the trade unions and workers rights as had the Tories. In the postal dispute Brown made it abundantly clear to the CWU whose side he was on when he told striking postal workers to go back to work. The Government pushed through �market freedom� for the break up and privatisation of Royal Mail -something even Thatcher was scared to do. This allowed cheap-labour delivery firms to cream off profitable business, leaving Royal Mail with unprofitable parts, leading to the attack on pay and conditions. From the minute MPs� voted for that, a battle between the workers and government appointed bosses was inevitable as they sought to close Mail offices and reduce the workforce. The �relationship� with Labour got us nowhere except a life or death battle for our union and jobs. Now, precisely when the bankers �free market� is most discredited Labour propose to privatise the Royal Mail! They want to leave the taxpayers with the debt and hand the profitable parts to private companies. They want to further hammer our conditions and our union. Labour has voted for and continue to close Post Offices. Closing 2,600 by April 2008. We have to witness the hypocrisy of Labour MP�s (and now even Tories who closed 3,542 while in office) turning up to �protest� at closures they have voted for! Like Tony Soprano when he covers his backside by attending the funerals of people he�s had bumped off! Saying one thing, but doing another, the government is at the forefront of these attacks on our union and it�s members. Whilst the issue of Royal Mail Privatisation and Post Office Closures are key issues for the CWU so too are the wider issues of the Anti Union Laws, Privatisation, Cuts In Public Spending , Tuition Fees, Prescription charges, Privatisation of NHS Services and the lack of decent council housing. In addition, BT which was privatised by the Tories has been left in private hands under Labour to be run by fat cats resulting today in cuts in pensions for BT employees, the proposed loss of 10.000 jobs in the industry and a pay freeze just to add to the misery. Agency workers have been dismissed overnight with a weeks notice, so much for the �Power Up For Agency Workers� campaign. Workers in the outsourced and divested sector face the same attacks in many cases from a weaker position as they struggle to retain union recognition. The unions� policy on Public Ownership of the Telecommunications Industry once again has been ignored by the union when considering its political strategy. Any remaining doubt that the funding of Labour is in any way beneficial to our members in the CWU must now surely be cast aside. While some in the leadership may still believe that there is no alternative, this position is becoming more and more difficult for them to defend. 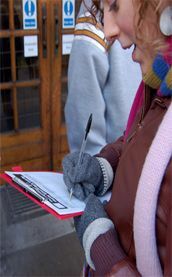 If individual members and activists in the CWU wish to remain in the Labour Party, including the General Secretary who has stated that he �will die in the Labour Party� then that is their prerogative, however it should not be the determining factor in relation to the political strategy of a union that faces thousands of job losses across the Postal, Telecoms and Financial Services Sector. The leadership of the CWU in referring to the proposed job losses and the financial position of the union have raised merger with other unions as the solution to secure the unions� financial stability. The real alternative surely would be to stop financing Labour to the tune of millions of pounds, and to launch a huge political campaign jointly with other unions such as the RMT, PCS, FBU and POA etc to begin to construct a New Workers Party to contest elections. One that could provide an alternative to the current main parties who all ultimately defend capitalism and the private sector which is so spectacularly failing the working people of Britain and the world. This is the alternative that is required to provide our members and workers generally who have not bothered voting or have turned to the BNP to protest at being ignored by Labour. Given EU laws are the fig leaf Labour ministers hide behind to justify privatising the Post Office it would clearly have made sense for the CWU to support the RMT-initiated No2EU � Yes to Democracy European elections list with its anti privatisation and pro workers rights stance and mobilise our members behind it. The CWU should be at the forefront of ensuring that a workers� alternative such as this is offered at a general election when it comes. Dave Ward the Deputy General Secretary of the union made the point at the National Protest against Royal Mail Privatisation in Wolverhampton on the 14th March when he said that �there is a need for a political alternative to what is currently on offer and it doesn�t necessarily have to be through Labour� this to huge cheers from the crowd. The issue will be on the agenda again at the 2009 conference, by then however the union should already have carried out the mandate from 2008 conference and have balloted its members. Failure to do this would be extremely damaging for the current leadership of the union as the onslaught of job cuts and privatisation takes its full hold. Unions no longer have a political voice and face 3 establishment parties who oppose us. Currently the union gives money to the Labour Party, but what for when they vote to attack us? When they keep the most anti union laws in the western world that make it harder for us to fight to defend our conditions? Trades Unions should work for new party to stand up for working people, a party that would stand up for the millions not the millionaires. The CWU should be playing its� part in building such an alternative.